Loughborough History and Heritage Network | Anyone for Tennis? So Wimbledon’s here again with Sue Barker and a team of celebrity commentators on the BBC, including John McEnroe, Martina Navratilova and Tim Henman. Look forward, if you’re there, to queues and controversial calls, tarpaulins and tantrums, rainy days and royalty. That grassy bank by Court No 1 with a view of the big screen – is it still Henman Hill or maybe nowadays Murray Mountain? The first ever Wimbledon tournament in 1877 was the first organised tennis tournament in the world. Only men’s singles were played until 1884 when women’s singles and men’s doubles were introduced. Women’s doubles and mixed doubles began in 1913. The commentator for the 1984 Men’s Final was the legendary Dan Maskell, known as ‘the Voice of Wimbledon’. Dan Maskell was Professional Champion of the World sixteen times between 1928 and 1951 and was coach to the British lawn tennis team which won the Davis Cup in 1933. That Davis Cup team included Fred Perry who also won three consecutive Wimbledon titles 1934-36. It was to be 77 years until another British man won Wimbledon, Andy Murray beating Novak Djokovic 6-4, 7-5, 6-4 in 2013. 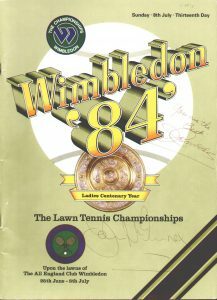 Dan Maskell’s programme for the 1984 Final was autographed by the two finalists, Jimmy Connors and John McEnroe. Their signatures are faint but Jimmy Connors has added ‘You are the Best’ – which Maskell certainly was. In the final McEnroe beat Connors in straight sets 6-1, 6-1, 6-2. Other players who signed Dan’s programmes over the years include Ken Rosewall, Lew Hoad, Bjorn Borg, and Pat Cash. During the Second World War Dan Maskell had served as the RAF’s Rehabilitation Officer. He came to Loughborough in 1942 when the RAF Medical Rehabilitation Unit was relocated to Loughborough College, the forerunner of the present university, having been bombed out of its previous quarters in the Palace Hotel in Torquay. Hazlerigg and Rutland Halls provided accommodation and the College swimming pools, gyms, and playing fields were used for rehabilitation. Among the Physical Training Instructors who served with Dan Maskell at Loughborough were several well-known footballers including Sergeant Raich Carter, an England international who played for Sunderland before the war and Derby County and Hull after the war. When Maskell found he had as many as seven professional footballers as PTIs, he arranged for them to play for Derby County – ‘for every home match a bus would deliver twenty-five of our patients to watch our PTIs running rings round the opposition on the football field’! He also organised a number of charity football matches and tennis tournaments featuring well known players, such as those for Loughborough’s ‘Wings for Victory’ week in 1943 and ‘Salute the Soldier’ week in 1944. By the end of the war over 10,000 airmen had been treated at Loughborough and restored to active duty or civilian life. The Dan Maskell Collection in Loughborough University Archives includes programmes, photographs and many other tennis related items, and the Dan Maskell Tennis Centre on campus now houses eight indoor courts and the LTA Academy. Dan Maskell’s programme for the 1984 Wimbledon Final, signed by many of the greatest players of the day, is part of a collection of sporting memorabilia held by Loughborough University Archives. Watch Pathe News footage of Wings for Victory Week in London in 1943.